From time to time, most bloggers come to a blogging crossroads where they wonder if they should continue. After all, blogging eats up a lot of time and it is a kind of thankless, self-indulgent sort of undertaking, isn't it? I have been at this crossroad before, and opted to continue. Logic would have it that the more one encounters this crossroad, the more likely he will choose to end his blog. This is because deciding to continue from the last crossroads encounter got him back the place where he must question the intelligence of continuing. Why would I end this journey now? 1. The first thing that comes to mind is that inevitably if one blogs about anything near and/or dear to anyone else, drama is bound to ensue eventually. It is very easy to have one's intentions misconstrued when there is only the written words. The Lord knows that I have been in pickles with friends of mine concerning emails in the past. I take full responsibility for stepping on others' toes when it is my writing that delivers the blow to the lower phalanges of my readers. It is rather stressful to have to think about it and worry about pre-screening when one is "in the zone." In my current state of mind, when it comes to blogging, I would rather give it up then hurt or upset people I have come to care about. 2. The popularity of this blog has dwindled in recent weeks. My technorati authority number is half of what it used to be, for example. I don't really think it is less interesting, but I wouldn't, would I? I think it has to do with me posting less frequently than I used to because my life is so chaotic right now. Not only am I blogging less, but I also have less time to read your blogs and comment. There is an obligatory element among the blog community that operates under the 'blog rule of reciprocity". This states that if you comment on mine, I will comment on yours. Stop coming to mine, don't look for me on yours. I would rather not participate in this kind of mentality. I read and comment on your blogs because I want to - when I find the time. There are many blogs I read and comment on from time to time and I NEVER hear from them here. It is a mutually exclusive relationship for me. Still, there is a definite pattern there that can't be ignored. I would like to think that this blog will bring readers and commenters because of its content, not because of the social rules of blog society. I guess we would all like to think this. 1. I guess blogging and my little corner of the blog community is a part of me now. I would miss it and you a lot. 2. I NEED to write. I haven't given up my dreams of writing bigger and better things. I endeavor to be a relevant writer. Blogging gives me an incentive to write regularly. That is important for a writer. Part of me thinks that if I stop here, I will eventually stop altogether. Another dream dead is a depressing thought, isn't it? 1. Obviously, I could quit. I really don't have time for a hobby anyway. Any of the 10,000 people over the past years wanting to buy my project car decaying in the back of my mother's driveway can attest to that. 2. I could quit THIS blog and start another one that is less personal and more controversial. I can learn to not care about what others think of me and concentrate on the issues. It would kind of leave the "community" aspect of the way blogging is for me now, but trade it in for this kind of thing. 3. I could just continue the way things are and chalk it up to the reality of the world of blogging. I must admit that all three of these options are somewhat depressing which again brings up the question, "Really, what IS the point?" I wonder what you think. . . 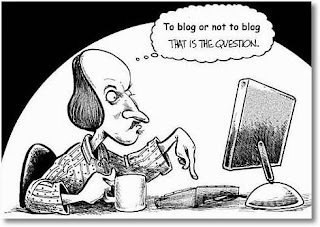 I suppose that when you get right down to it, it depends on WHY you blog. Not why you started, but why you do it NOW. Would you still do it if you blogged and no one came? 1) If you have the urge to write, you will write. Sometimes I feel like my blogging takes away from the other things I would write because there is only so much time in the day and if I spend it blogging, I don't get around to the other stuff. 2) A virtual life is no substitute for a real life. If you're unhappy in real life, you need to get out there and do something about it and not spend that time here in virtual world. 3) If your life is that crazy-busy, do you feel guilty about spending time and energy here - you shouldn't be here. 1) Sometimes you need a place to go to talk about things that may be too sensitive or upsetting to people in your real life. I don't talk politics in my real life. I don't talk about it at all actually. I also don't confess my doubts about motherhood, my marriage or my husband's family on my blog because they all read it. I do have another blog for just that purpose and when I feel the need to vent, I go there. So blogging can be a great safety valve on your personal life. 2) A record of your thoughts and feelings is a valuable thing. I write my blog for my son, so that there will be a record of who I was, and who we were as a family. What we did, when we did it, what I thought about it. My biggest regret after my grandmother died is that for all the information she divulged about her life, she may as well not have been here. 3) I need the regular writing to stay sane. It's a way of doing a short piece without sitting down on thinking wider scoped thoughts. And I find that I do write more when I write more. But that's me. Ultimately, whether or not to continue your blog is up to you. I have very much enjoyed being a vicarious part of your life, and following your trials and tribulations through the last couple of years. I consider you a serendipitous friend - one I would not have "met" otherwise. If you stop, I will miss you. But I WILL understand. I totally understand your point of view. I've hit that crossroads a few times. Usually, I just chill out on the posting/commenting for a while and I end up coming back. But it's up to you and your reasons for blogging. From your post, I think you already know that. It's just a matter of deciding what's for you. I believe Journey said it best... "Don't stop, believin...."
I think it would be a shame for you not to continue. I myself go through periods such as you describe. Just the last few months I've posted less and less. I guess when it comes down to it, I have a need to express myself in a slower deliberate, thought out way that is rarely found in every day life. Not only would your readers and I miss hearing from you in this forum, I believe you would come to miss it after a time as well. "After all, blogging eats up a lot of time and it is a kind of thankless, self-indulgent sort of undertaking, isn't it?" I guess it depends on your reasons. If you blog about yourself because you think you're so interesting that other people will want to read about you, then I guess it's self-indulgent. If you blog because you want to share with others, and they read because they want to share lives with you, in the way that friends do, then not so much. Friends and family take up time and emotion and patience too, but I don't give up on them. I think of people on the net and their blogs in a similar way. I learn from them, they make me laugh, they share wisdom and knowledge... they're real friendships... in a way. They probably won't have the same sorts of bonds and associations, but they're important to me none the less. That's why I wouldn't give them up. If it's the same for you, don't give them up. Same sorts of bonds and associations as "real world" friends and family that is. I don't want you to quit, but I would understand if you did. Just remember: there are NO blogging rules. You can write what you want, when you want. Don't worry about your popularity, or what you say, or what anyone thinks. It's YOUR blog - do what you want. We're here for you either way. Sayre: Thanks for your thoughtful feedback. I think the reason I started blogging is different than the reason I am blogging now. I don't blog enough to live out a fantasy social world, but I do like the addition - till drama happens, anyway. Chris: I think EVERYONE contemplates this from time to time. One of my dear blogging friends has left and I think about her a lot and hope she is doing well. Brian: Are you saying that I am "living just to find emotion?" ;) I get enough emotion. I would rather be a Vulcan. I know I would/will miss blogging. Otherwise, I probably wouldn't have lasted this long. Kristarella: I think that the "self-indulgent" aspect is blogging about yourself despite what others would want to read. Personal blogs are self-indulgent by design so it just comes expectedly as part of the territory. I do agree that the relationships, in nature, are similar to those in real life. I guess that is why it bugs me when someone I care about gets offended by something I write. Hoosiergirl: I agree that in a blog one should do what he wants. I have provided this very counsel to another blogger. However, there is a balance between what the blogger wants and what result he wants from the blog entry. Sometimes, those two wants are not compatible. Tragically enough, sometimes one can't know in advance when it is compatible and when it is not. It would be nice to be a Vulcan, they probably would get tax immunity. And if they didn't they wouldn't care anyways. Also just realized, a dilemma is defined as a problem with only two possible outcomes. You listed three here. So you obviously don't have a dilemma on your hands, which means the solution is obvious, you must continue to blog as you have been, until such time as you have an actual dilemma. See there, I used logic to solve your problem. Just like a Vulcan! Jeff - I have something for you on my blog! I've been chewing over the exact same questions. In fact, I've been back online a week and not blogged because I'm not sure what I want to do next. The thing that is keeping me here at the moment are people out here in blogland (like you *grin*) that I'd truly miss if I stopped blogging. Michelle: I always knew we were kindred spirits. Internet friends . . . we are such geeks. Man have I hit the crossroads a number of times. I came back each time. For some reason I just couldn't let go of my blog(s). They are apart of me. I've invested three years of my life into my online journal because I have had difficulty expressing my feelings, and my opinions to others. I guess you could say its my venting system. Why are you here? In a sense that would be THE question to ask. I hope your not leaving though Jeff. I really like reading your blog. I think you should keep blogging, this is my first visit and I really enjoyed reading this post. I think all of us cross this path over and over. You do not have to post everyday to have a blog, or keep it to just one stream of thinking. Pretend its just a place you jot down your thoughts. 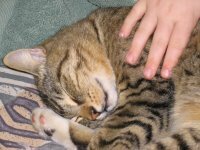 Only blog if you feel you want to on the day. thats what I do anyway. Every one is entitled to their own opinion and for one person to take offense over your opinions is their problem. Not yours! People that generally get their back up like that are usually not very nice people anyway. Charles: Thanks. I would and have missed yours in your absence, also. Karisma: Welcome. If you have read any of my archives, you saw that I have NO TROUBLE skipping days. LOL I guess the main reason I continue the blog like I have is because of my little blogland community. That is why I don't like to risk offending any of these that I care about. Well, speaking from experience, I would take Chris's advice and just take breaks when you need them. Blogging has created its own little place in my life, and though its not an enormous place, the people I have come to know through it have positively impacted my life in unexpected ways - and to unexpected degrees. I think the key for me is to not put too much pressure on myself to keep up the pace or the creativity, or ...whatever. Just be. For what its worth, it wouldn't be anywhere near the same without you. HollyGL: I agree. You don't have to choose to take breaks, though. Breaks thrust themselves into the equation without thought. Welcome back. Missed you a ton. That's a tough one indeed. My view on this would be that to start reducing your community base. That might be a major problem as you don't have time to read. By doing this, you have more time to post your own comments and think. Also, less people to "reciprocate". Shan: I am not really trying to reciprocate. I am just living. I visit the blogs and comment when I can because I have grown to care about those people. It is what it is. Still, I think you are thinking logically, here. If you wanna blog, then by golly, you should blog. My blogging is sporadic lately because 1. my readership is at its ultimate low (probably as a result of not blogging - it's a vicious cycle!) and 2. I'm busy like a madwoman. But blogging makes me very happy. And if it makes you happy, then you should do it. But if it feels like work and a drudgery, then maybe not. Meg: I like blogging. Truthfully, there is an insecurity there somewhere that makes me afraid of offending someone. I think it has something to do with it being "in my house". I don't want to be inhospitable, you know what I mean? If people are nice enough and care enough to visit, I don't want to be a jerk to them.